American refugee Dawud Salahuddin said today in an interview with the Christian Science Monitor in Tehran that Iranian police had detained Robert Levinson during a meeting between the two men on March 9, 2007 at the Maryam Hotel on Kish Island. Salahuddin added that Levinson had been trying to recruit him as an informant before his arrest. Levinson, a former FBI agent, was working as a CIA contractor at the time. Salahudin, who has lived in Iran since carrying out a 1980 assassination of an Iranian opposition member in the U.S., is the last civilian to see Levinson alive. He told the Monitor that he last saw Levinston surrounded by four Iranian police. Salahuddin meanwhile denied suggestions he had orchestrated Levinson's arrest. “I’ve seen all those things, that I set the guy up and all that. Listen, I don't do things like that -- that's not a part of my makeup,” Salahuddin said. By "police", does he mean uniformed NAJA? plainclothes NAJA? VEVAK? What? If they weren't uniformed NAJA, how does he know the four were police? Was Salahuddin detained? If not, why? 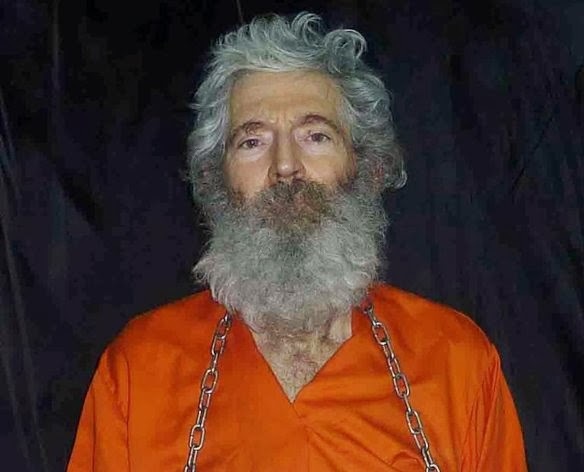 The only thing we know for sure at this point is Levinson's mission was worse than a complete failure. Salahhudin by now has enough experience to recognize police action! The comments above were not about the issue of espionage, but whether the Iranian security agents had arrested this man, as claimed by the eyewitness, and if he's still under their control. http://www.youtube.com/watch?v=d0pBPuz1UIc --- American held in Iran was spying for CIA. hang on but that murderer Salahhudin was saying previously that he had no idea what happened to the CIA agent! Now he is sayinbg the agent was arrested by the Iranian Police. The likelohhod is that the whole thing is a confusing set up. In effect Salahhudin inside Iran himself is sturring the s*** causing issues for himeself and his familiy. In reality Salahhudin is probably fed up of being stuck ion that big Prison Iran and wants to get out at all cost back to US. Yes you are correct. Salahuddin the wanted terrorist murderer of an Iranian national in the US will rather be locked up in a US prison than stay one more day in the biggest prison in the world namely Iran under the Islamic terrorists. "Yes you are correct. Salahuddin the wanted terrorist murderer of an Iranian national in the US will rather be locked up in a US prison than stay one more day in the biggest prison in the world namely Iran under the Islamic terrorists". Dawud Salahudin, effectively and proficiently dispatched an Enemy of the state of the I.R.I. he was substantially rewarded, and celebrated as a hero in Iran, according to my sources he is an English teacher and a contract Advisor member of VEVAK..(MOIS) Western Desk Division. He also was given a full Scholarship to practice Medicine in Iran. But he dropped out of Med School because he decided that he was a better Spy. And for the record he is a wealthy man in Iran, something he could never be in America. touché, Idiots!